The Sullivan’s Cove Double Cask is like a beautiful and delicate flower, be patient and nurture it to let its beauty unfurl. It has many components but it requires careful attention to hear it. 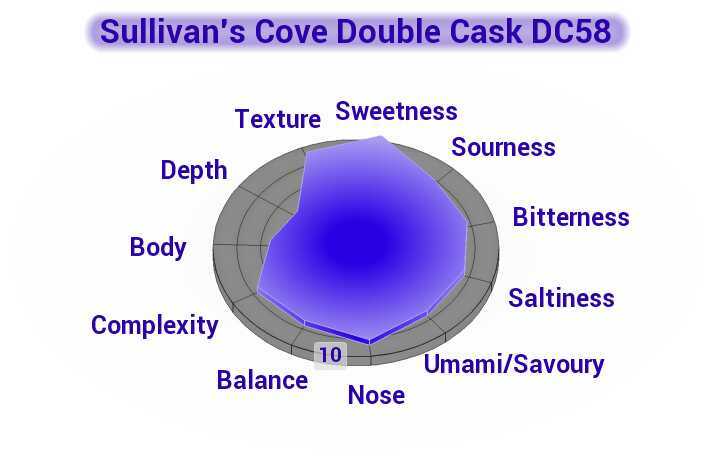 While the Sullivan’s Cove Double Cask plays hard to get it is well worth the chase, trust me. Congratulations to Sullivan’s Cove, a Tasmanian distillery, for producing a sensational whisky. It takes a long while to unpack and get to know, but once you break the ice expect quite an experience. The only problem is while there is a lot happening, I found it was hard to detect a lot of what was happening and it needed careful concentration. This made it a little dull, unfortunately. This is a single cask whisky, from cask DC 58. Its youngest barrel date is 28/07/2000 and its bottle date is 13/04/2012 (according to the sample bottle). There were 943 bottles in this batch. Two American Oak barrels and one French Oak barrel was used to produce this particular cask, and well done to Sullivan’s Cove for doing this! It has a spectacular character after getting acquainted with it. Speaking of single casks, I am waiting for another Sullivan’s Cove French Oak that is taken from a different cask to the HH436. Because every cask is different, you can expect a different review of a different whisky. The light waft of watermelon fills the glass with sweetness, as honeyed oats add substance to sprinkings of cocoa. A mild bitterness is present in the form of oak. Among the oak are sweet lemon drops and a fresh country breeze; carrying with it floral notes. I am taken back to my visit to a lavender farm in Melbourne on a sunny Spring day. Fresh and light, this nose still has a splashing of rainfall and lush green with some fresh peach and apricot. Beautiful whisky! Creamy – though not oily – with different flavours grappling with one another; and that flickering light in the room has suddenly started to shine! Great balance, and because its character is coming out its puts on a pretty interesting show! Initially, it was slightly uninteresting but now my tongue seems to have caught up and the layers are peeling away beautifully. I better stop or else I will be here all night! There are some characters that remain locked away behind a door, cloaking their personality. This whisky was very shy at first, but now it softly drapes the drapes the tongue like velvet and releases bursts of oak and honey, with a sensational bitterness that is like a dense poppy seed orange cake smothered in brandy and the finest of dark chocolates. It has a youthful spark that I absolutely adore now, as a dense cloud of that sumptuous orange cake tantalizes the tongue. It is fresh and light, with a lot happening. Please, Sir, can I have some more? Long and enjoyable, though it loses some puff towards the end.